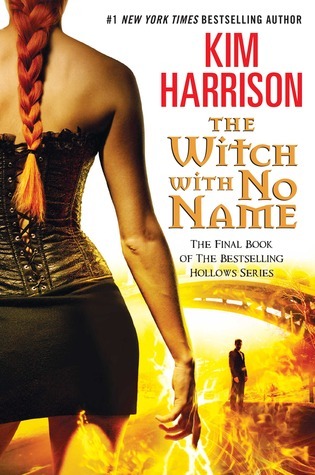 The Witch With No Name (The Hollows, #13) by Kim Harrison – Thanks for the memories! Synopsis: It’s Rachel Morgan’s ultimate adventure . . . and anything can happen in this final book in the New York Times bestselling Hollows series. To save Ivy’s soul and the rest of the living vampires, to keep the demonic ever after and our own world from destruction, Rachel Morgan will risk everything. . . .
Review: New Hollows Day is probably as good as Christmas Day for many of us. Not to mention this one has come much sooner than expected! But if I’m being honest, this is probably my toughest review yet. It’s taken me so long to get it together because I just keep drawing a blank. Part of it is because this is the end of my favorite series ever. But I have accepted that this must happen to all good things, or else they could risk not being so good anymore. Kim Harrison brought this novel back around to be about the vamps. She made good on her promise compared to other recent books where they sat more on the back burner. It appears to be for good reason though because vampires are the key to changing everything. There were some revelations that truly surprised me and the unpredictable twists kept me at the edge of my seat the whole time. I was happy to see the demons and elves get a healthy dose of focus as well. Over the years I have grown very attached to their story lines and was happy to see they wouldn’t have too many loose ends. Rachel and Trent. Yeah, if you’re a fan I don’t see why that would stop now! They display great teamwork and definitely turn up the heat as they’re settling into their relationship together. It’s satisfying to see but still hard to believe it’s happened considering the long road they took to find one another. Of course it still isn’t easy for them. They have very complicated lives, but their determination to make it work just gives a girl all the feels in the world. Rachel takes her relationships seriously and her friends and family are as strong as ever. We get the answer to the question of whether she is able to save Ivy’s soul. That alone is worth the price of admission if you’ve stuck it out with this series for as long as I have. 9 years is the longest I’ve stuck it out with a series. But I finished it feeling satisfied and believing that the characters would be okay. Kim has done her characters justice and she should pat herself on the back for being able to give them what they deserve. And it truly feels deserved with a very fitting ending. They’ve worked hard and sacrificed so much. I enjoyed every page from beginning to end in this last installment. We received a lot of answers and many things were wrapped up, but at the same time it also feels like a new beginning so I still want more! I just don’t know what I am going to do without my favorite witch, demon, elf, pixy, and vampire team to look forward to once a year. *ARC provided by the publisher. *Review also posted to Goodreads and Amazon. I too am sad to see the end of the series. I love all the main characters and hate to say goodbye! I have yet to read this last installment and will be taking my time to read it since it’s the last. One series you might try is the Experiment in Terror series by Karina Halle. I loved it as well! Thanks Silvia! I’ve actually read and reviewed a few EIT books. Haven’t read a one of them in a while but I’ll resume it eventually. They are pretty good.